Week 3 of the college football season is a time when it becomes a little easier to figure out who the contenders and pretenders are. Some teams this week will face their first true, quality opponent. Other playoff hopefuls will seek to build on their early momentum. But there are some interesting subplots and specific matchups within the games themselves that make this week’s slate all the more compelling. Read on for some juicy Week 3 NCAA football matchups, which features a theme of highly-ranked teams hitting the road. A tangle of Tigers in the SEC. LSU defeated Miami (Florida) 33-17 in Week 1 to soar up the initial rankings, and just pitched a shutout against SE Louisiana in Week 2. 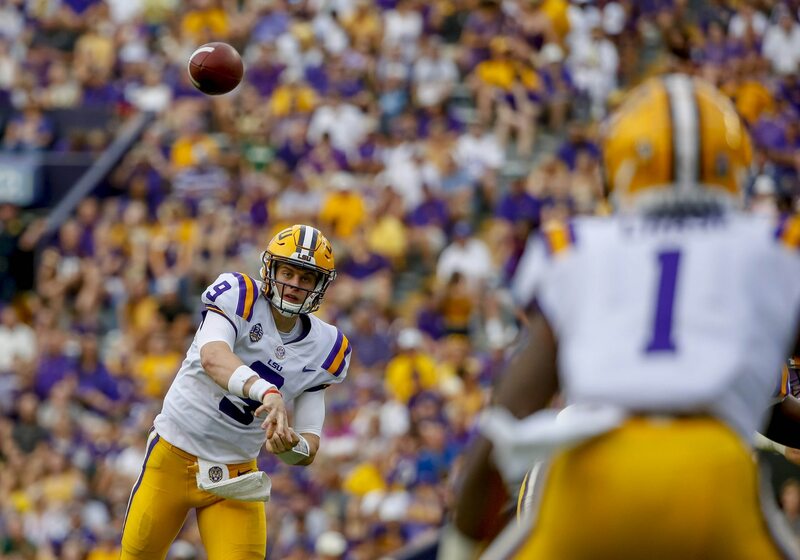 Big question mark: quarterback Joe Burrow is completing just 47.7 percent of his passes. That’s how good the rest of LSU’s roster is. Burrow must improve to complement lead back Nick Brossette well enough. Auburn has the clear edge at the all-important quarterback position with Jarrett Stidham. At least LSU has a lockdown corner in Greedy Williams to take away half of the field more often than not. With the game on the line, Stidham seems far likelier than Burrow to make a clutch throw and tilt the outcome in Auburn’s favor. The Fighting Irish notched a victory over Michigan in Week 1 but suffered a subsequent letdown, beating Ball State by only eight points. Senior quarterback Kyle Shurmur, son of New York Giants head coach Pat Shurmur, leads Vanderbilt’s offense. Shurmur has the size and pedigree to be an NFL prospect, and could do himself some favors if he keeps the Commodores competitive in South Bend. That said, the talent gap should be evident — despite Vandy being an SEC team. Notre Dame has benefited from a jump in passing accuracy by dual-threat signal-caller Brandon Wimbush. However, he threw three interceptions in Week 2 and must improve ball security to improve the Irish to 3-0. The Utes lost to the Huskies by a score of 33-30 last season. Utah used that as a springboard to win its season finale, become bowl eligible and triumph thereafter versus West Virginia. Washington was already beset by an opening loss to Auburn this year, so a lot is at stake on this road trip. A second defeat this early would render a playoff berth almost impossible. Tenured Huskies starter Jake Browning has a had a rough beginning to 2018, throwing three touchdowns and as many interceptions through two contests. He must play better to keep the Utes defense honest and not simply crowd the box to stuff running back Myles Gaskin. With receiver James Washington and quarterback Mason Rudolph now members of the Pittsburgh Steelers, the hosting Cowboys don’t have quite the dynamic offense of yesteryear. The good news: Justice Hill is still in Oklahoma State’s backfield, and he’s as explosive as any back in the country. Hill has only 21 touches through two weeks of action but figures to feature heavily in this one. The Broncos figure to have the edge at quarterback with Brett Rypien, who looks sharp as ever in his fourth year as a starter. Rypien gives Boise State the type of continuity under center the Cowboys enjoyed with Rudolph — and that may well tip this matchup in the Broncos’ favor. This showdown has some extra spice to it. The Boilermakers dominated Missouri a year ago 35-3. Tigers quarterback Drew Lock struggled mightily, going 12-of-28 passing for 133 yards and two interceptions. Lock is a probable first-round pick in next year’s draft. He’s at the controls of a new offense under coordinator Derek Dooley. It deploys more pro-style concepts, and makes Mizzou a little more difficult to defend. After some early-season hiccups last year, Lock wound up throwing for 44 touchdowns. He seems to have mastered the new system with eight scores and zero interceptions through two 2018 starts. Look out for a Lock vengeance game this Saturday in West Lafayette. The AP fourth-ranked Buckeyes boast an elite front, led by potential No. 1 overall draft pick Nick Bosa at defensive end. Bosa and tackle Dre’Mont Jones have already combined for seven tackles for loss and five sacks in two games. It’s going to take an epic effort from the No. 15 Horned Frogs’ big men up front to keep Bosa, Jones and Ohio State at bay. TCU lost four prominent offensive linemen from last season, including NFL draft picks Joseph Noteboom and Matt Pryor. With the contest taking place at AT&T Stadium in Arlington, Texas, at least it’s not far for TCU fans to travel. However, they may well witness sophomore signal-caller Shawn Robinson running for his life. A Heisman Trophy favorite, Murray could keep the hardware with fifth-ranked Oklahoma after Baker Mayfield won it in 2017. After strong performances in the first two weeks, though, the Sooners’ dynamic passer faces his stiffest defensive test yet. It’s up to Murray to keep playing to his high standard — and for the first time this year, on the road. What can crush opponents is Murray’s uncanny athleticism and ability to extend or make plays with his feet. Iowa State has a space-eater in the trenches in Ray Lima and three athletic, ball-magnet linebackers: Mike Rose, — a true freshman — Willie Harvey and Marcel Spears. They can keep Murray at bay and force him to win from the pocket more often. This is the wide receiver-cornerback battle to zero in on, because both these standouts should soon be playing on NFL Sundays. Johnson is an imposing figure at 6-foot-6, 220 pounds, and could be even scarier with a little bulk added to his frame. Marshall (6-foot-1, 205 pounds) is the only man in the Trojans secondary who has the stature to mark the big wideout. If not for an MCL sprain last October, Marshall may have already gone to the NFL. This is a big opportunity to boost his draft stock — and the same goes for Johnson. Texas is off to a shaky 1-1 start and could use a playmaker to step up and help protect home turf this weekend. With the Rebels ineligible for the postseason, this essentially is Ole Miss’ playoff showcase against the top-ranked, reigning national champions. Ole Miss boasts as strong a collection of talent in the passing game as anyone. It starts with quarterback Jordan Ta’amu, and extends to a receiving corps of first-round NFL draft prospect A.J. Brown, DaMarkus Lodge, D.K. Metcalf and Braylon Sanders. Ta’amu will be aggressive and his bevy of pass-catchers could well win battles against the Crimson Tide’s secondary more often than anyone this season. Alabama may have to dig into its defensive backfield depth to remain fresh. Look for first-year, 5-star stud Patrick Surtain II to see action and potentially make a game-changing play.